Pt. Isabel, Texas, Mexican War, shaded italic letters, partial 35x3mm straight line on 1847 f.l.s. datelined "Camp before Monterey, Sept. 25, 1846", letter addressed to Brig. 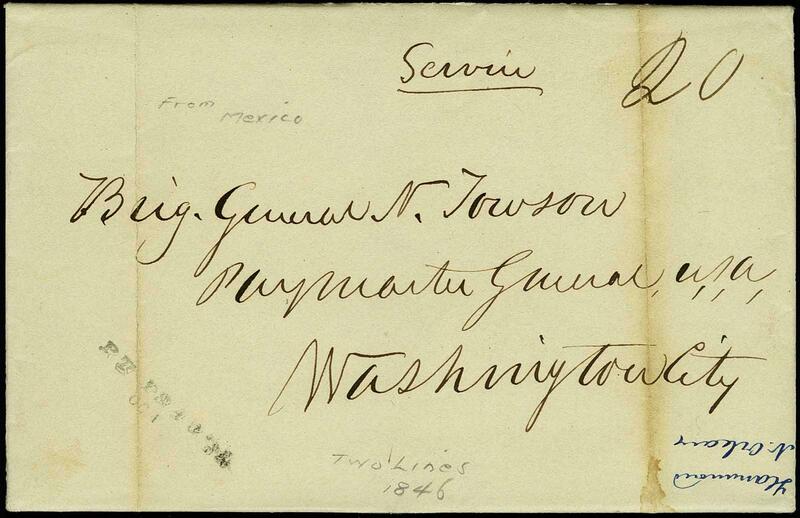 Gen. N. Towson, Washington City, contents include "Capt. Eaton General Taylors aide-de-camp will carry to Washington the news of the glorious sucess of our arms and the capitulation of Monterey", ms. "Service" and "20" rate, couple vertical filefolds, VF and scarce Mexican War cover. (ASCC $800).